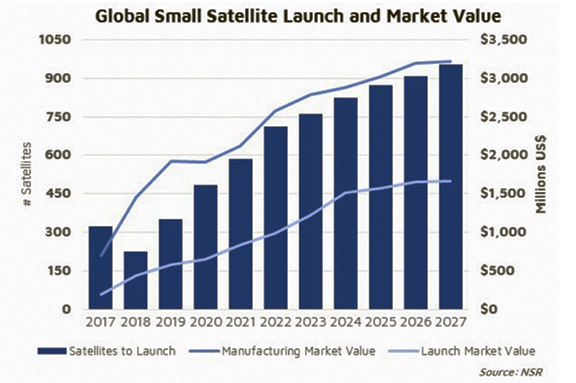 NSR’s Small Satellite Markets, 5th Edition (SSM5), just published, forecasts the market to yield $37 billion in cumulative revenues from smallsat manufacturing and launch services by 2027, with 6,500 smallsats set to launch during this time. Constellations will be the dominating factor of this growth, making up over 70 percent of the total market. While growth is anticipated across all applications, communications will drive the largest share of revenues, with some of the largest constellations planned in this segment. Despite the overall demand growth, funding remains one of the biggest challenges for the small satellite market. Investors are more cautious about the durability of this architecture. NSR considers the small satellite business model capable of challenging the status quo by bringing in new ideas and leveraging existing assets — both in space and on the ground — to derive more performance from established architectures. NSR’s Senior Analyst, Carolyn Belle, said that new business models are opening new revenue streams and opportunities in the small satellite marke. The relative simplicity, and the associated low-cost architecture, are enabling easier access to the space industry. By lowering the barriers to entry, this market is not only impacting the commercial industry, but it’s becoming a critical element of STEM education. Despite a 30 percent decline in launch rates in 2018, small satellites are expected to regain growth over the next decade as new companies in different tiers of both value and supply chains enter the market and unlock the promised value and solve current bottlenecks. Shagun Sachdeva, NSR Analyst and co-author, noted that while a growing market, the small satellite industry does present highly challenging business cases. From LEO constellations to dedicated launchers, long-term sustainability remains one of the biggest concerns. As the technology develops and small satellites grow in applicability, there will be a shift towards hybrid architectures — either through M&As or strategic alliances.